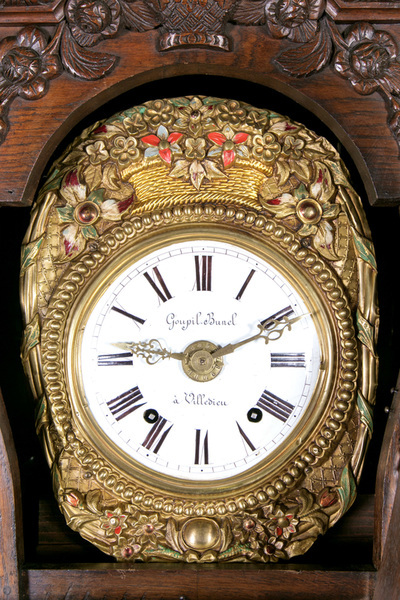 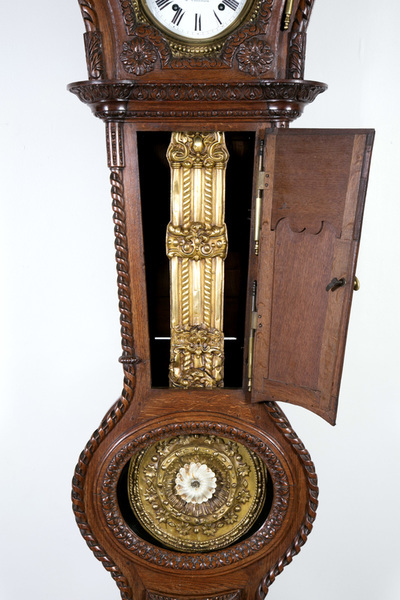 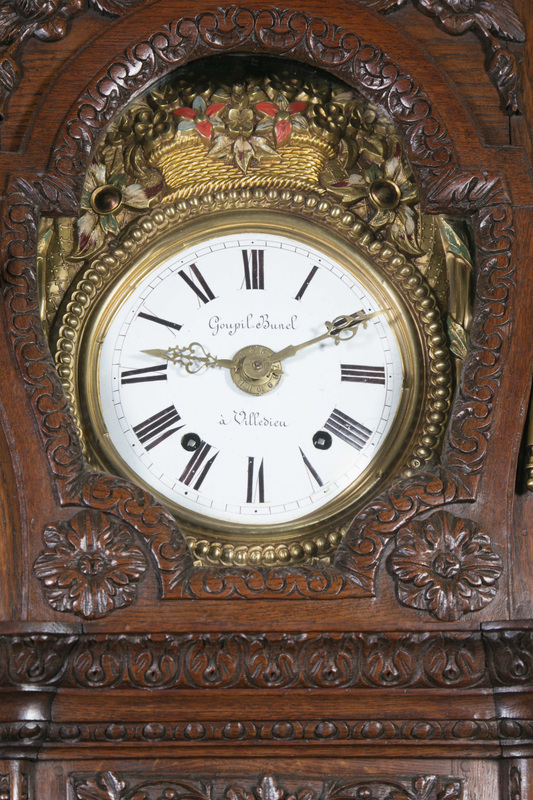 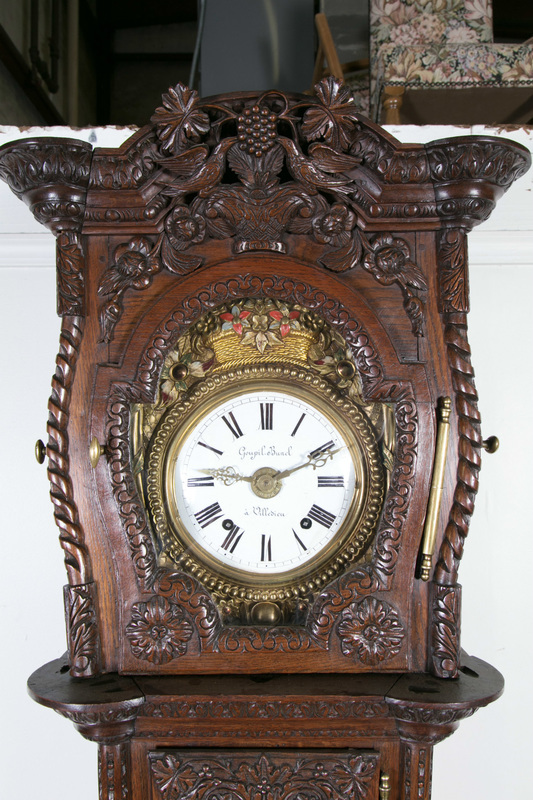 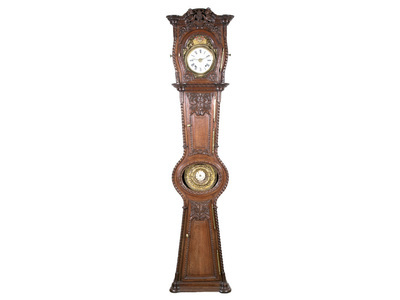 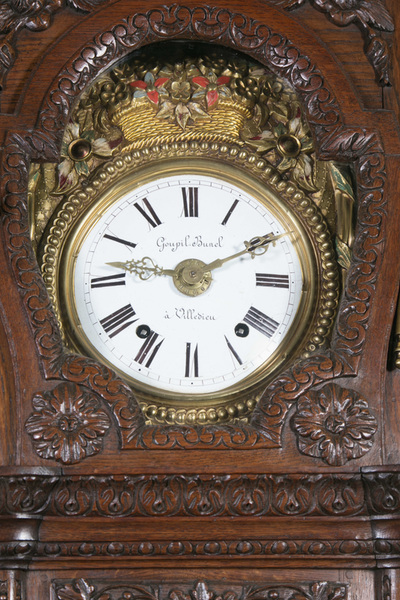 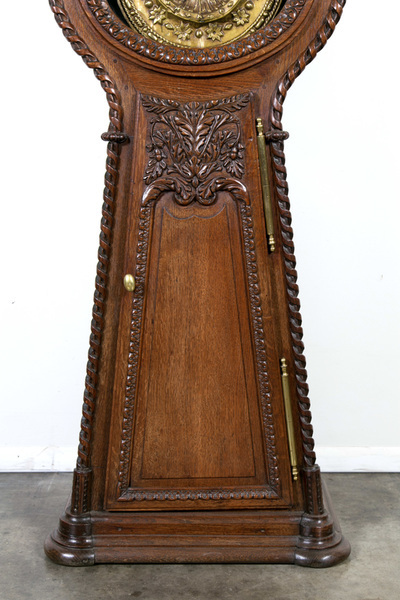 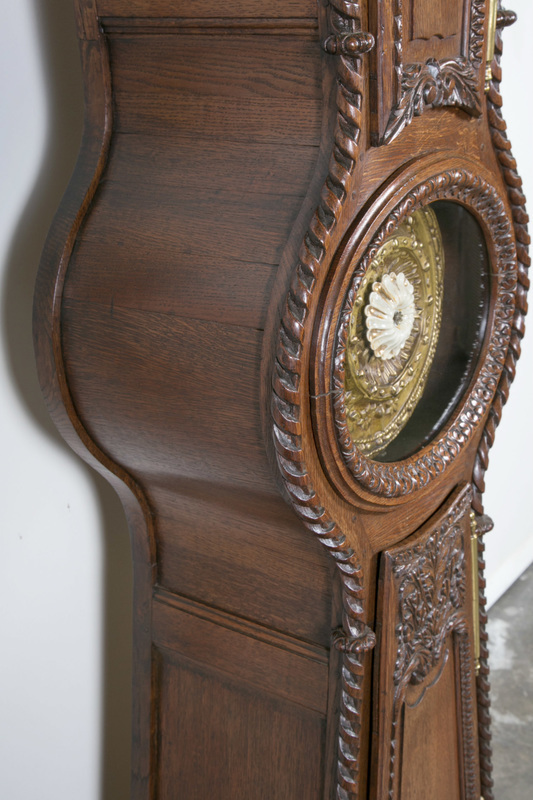 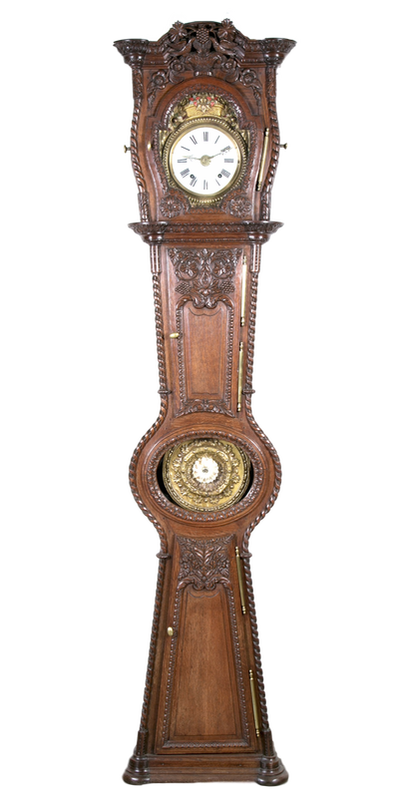 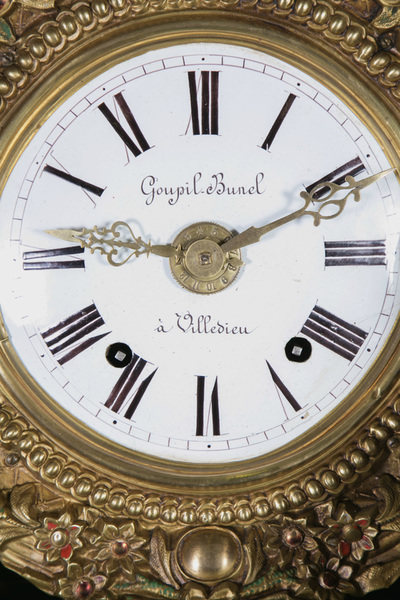 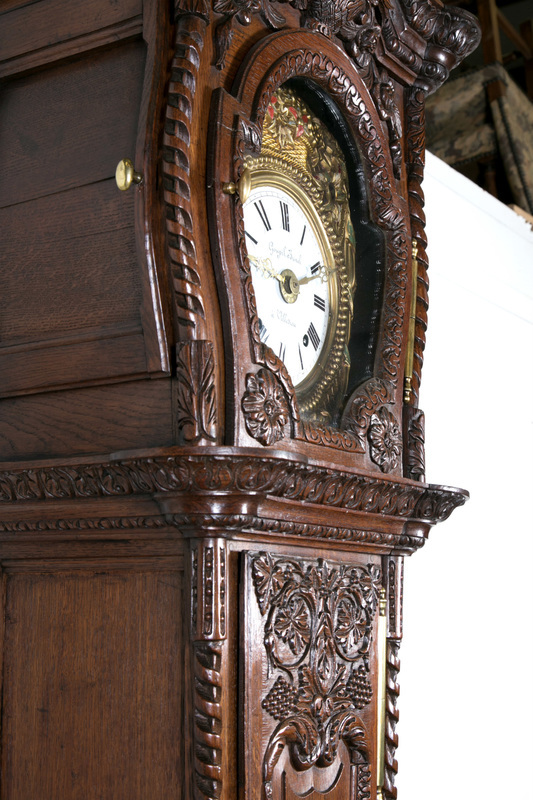 ﻿A rare, early 19th century French Louis XVI style Demoiselle de Mariage longcase clock that would have been part of a bride's dowry on the occasion of her marriage, having an 8-day comtoise movement, in moulded and carved oak with a stunning deep, rich patina that reveals the beauty of age. 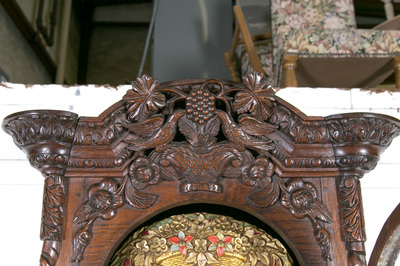 The symbolic carvings are typical of marriage pieces from Saint-Lô and the refinement exudes a rare elegance specific to castle pieces in the Basse-Normandie region. The arched cornice, evidence of the cabinetmaker's exceptional skills, is an ornate headdress with intricate carvings of grape leaves, vines, and a basket of flowers with trailing roses flanked by a pair of love birds, evoking love (roses and lovebirds), the attachment (the vine) and domestic prosperity (grapes). 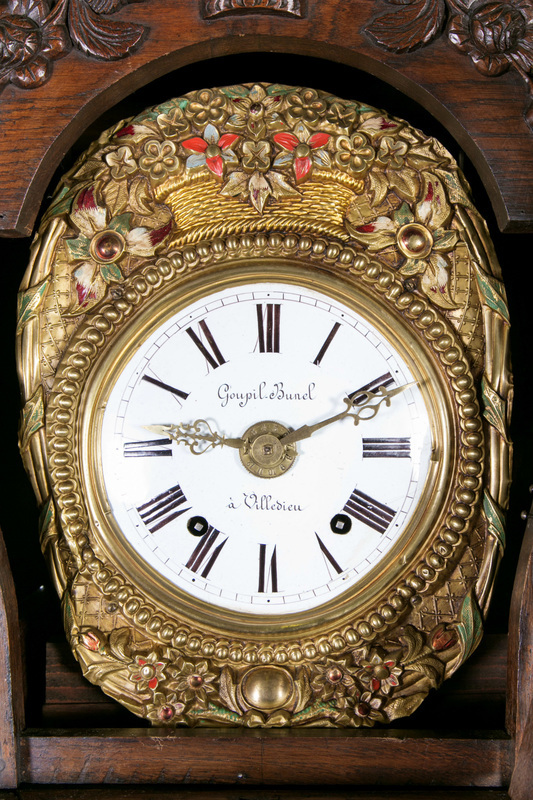 The dial case houses an enameled dial with Roman numerals and stamped brass hands. The pediment fronton of thin repousse from Villedieu-les-Poêles depicts a flower basket with painted flowers. 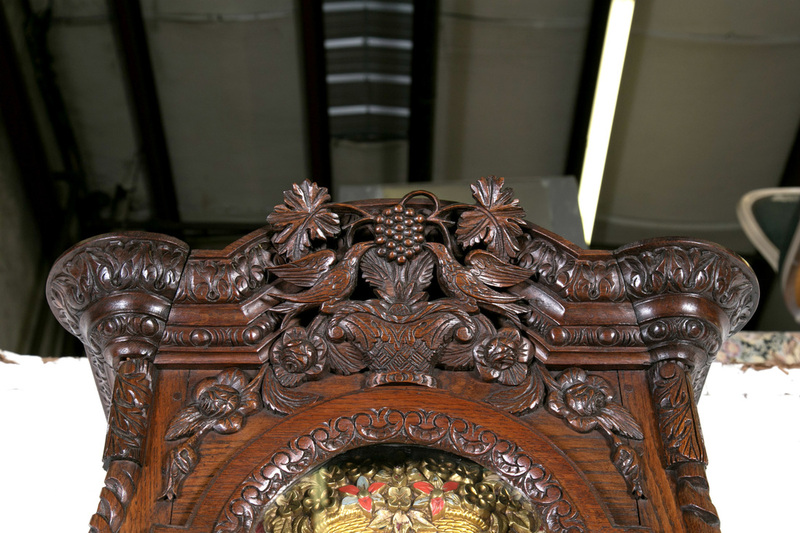 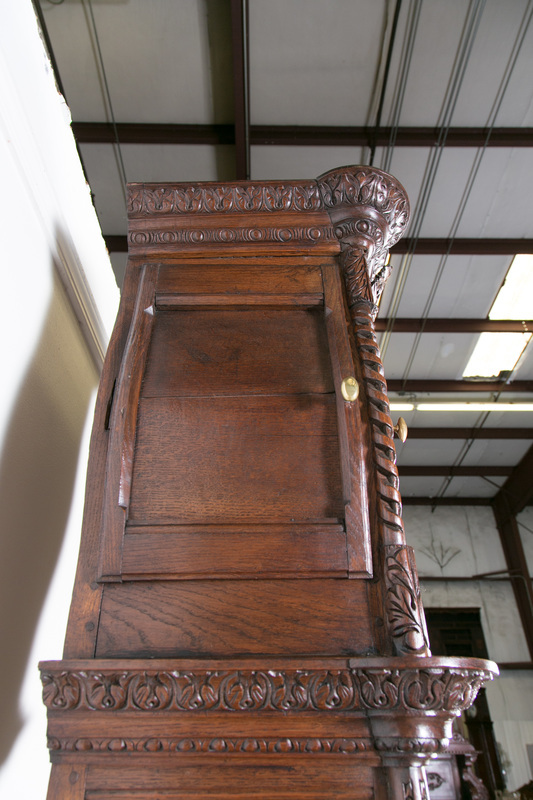 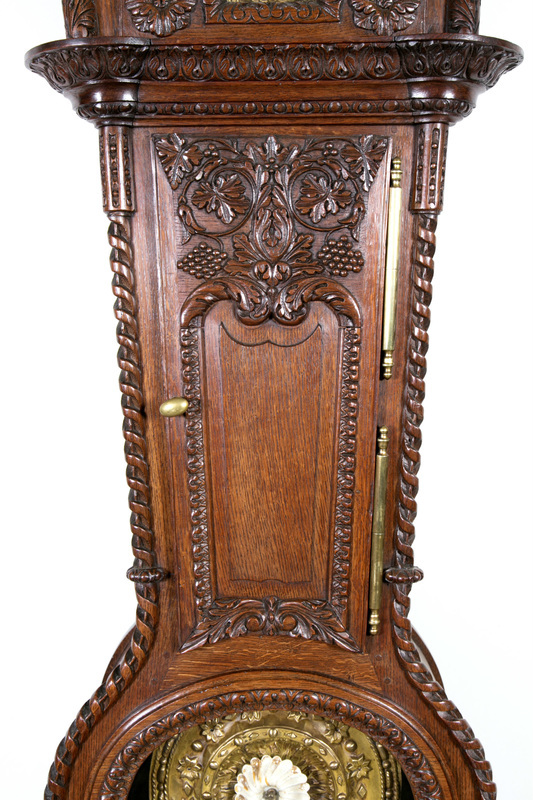 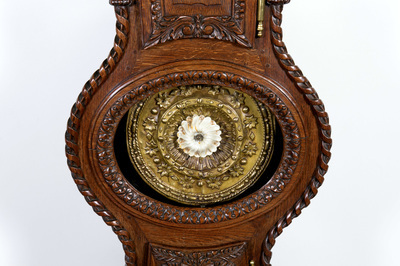 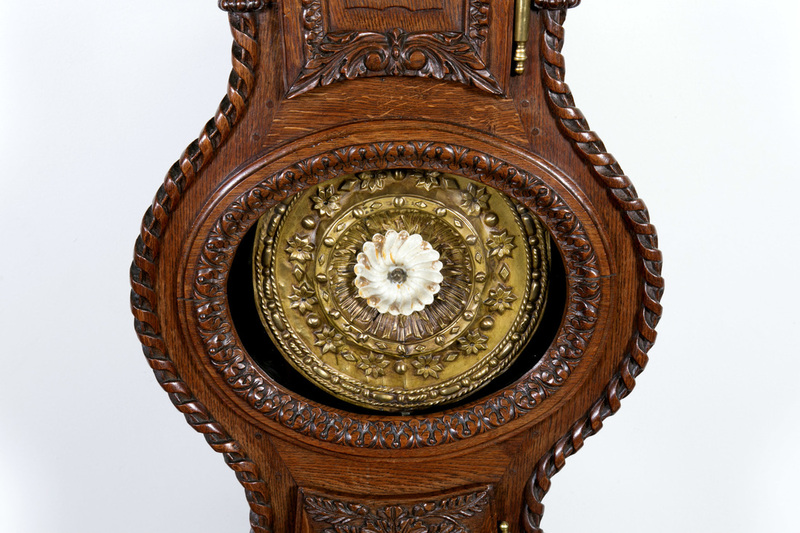 The lower case is charmingly curved with an oval oculus and features more floral and foliate carvings. 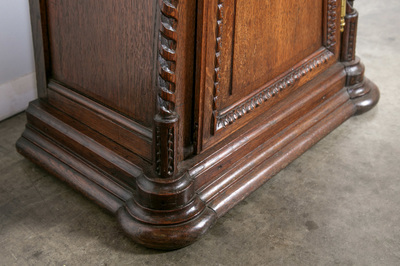 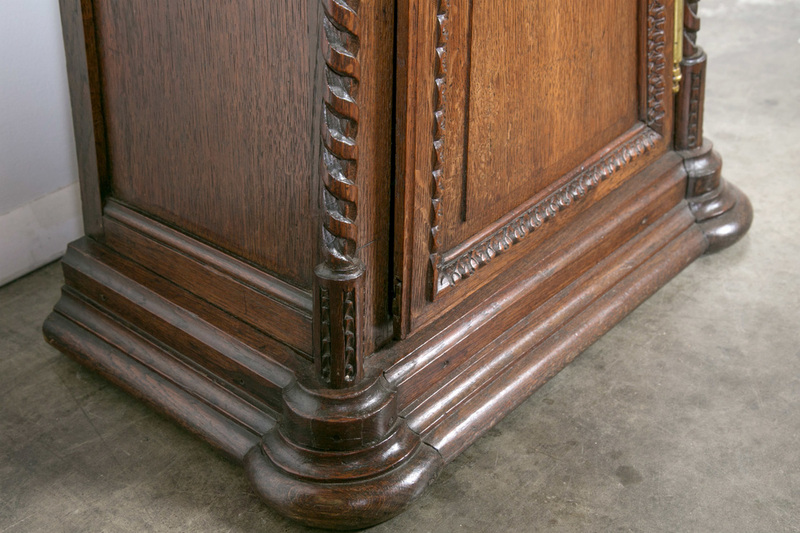 Rests on a carved and moulded plinth base. Completely original, excellent condition.